Despite enjoying a rising prominence over the last few years, the perception of drag artistry in Britain is still fairly one-dimensional. For the most part, the extent of the exposure a Birmingham student gets during their time at the university is an evening at Nightingales and ten seasons of RuPaul’s Drag Race on Netflix. 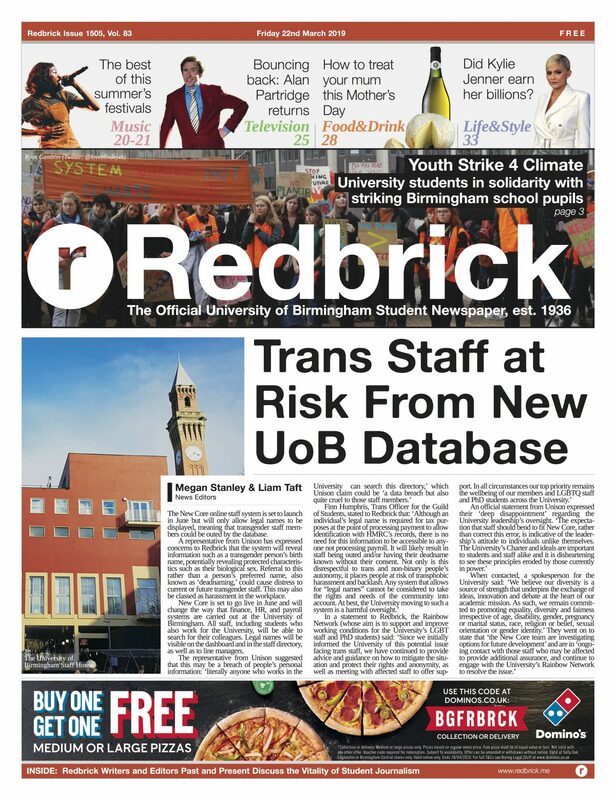 For Ashley Jones (better known by their persona Ashleigh-Marc), the founder and president of UoB Drag, the society has been created to tackle this exact issue. ‘It’s shocking – when I was actually doing the research for it, at that time there were only two other universities that had drag societies. They were very limited in numbers and in terms of the students that actually would participate. It was very drag-centric, you had to do drag to join it. What was your first experience of drag? ‘Obviously we’re trying to make it as inclusive an environment as possible. I’ve always said, many people consider drag just to be something that men do, but we want women to come along and experience it too. Also I think a lot of straight men can get deterred by it, thinking it’s an LGBTQ-themed event, so we try not to put any labels on it. We’ve got guest speakers ideally coming in, performance nights planned for the end of the year, and one thing we’ve already got set in motion is the ball we have planned at the end of the year, which will be... interesting. While it may not be at the forefront of mainstream entertainment culture yet, drag is certainly an industry on the rise. With its recent permeation into Netflix it seems as though shows such as RuPaul are bellwethers of a potential cultural behemoth. And yet there have always been rumblings that such a new frontier for the industry is having a negative effect on the community, reducing the concept of drag to only what the sanitised world of TV allows for. One of the misconceptions about drag is that it is a fixed identity – you are either Dame Edna or you are Alyssa Edwards. For Jones, this is part of the RuPaul effect. The realities of drag culture, they explain, are far more multifaceted. ‘The first thing I need to explain is all the different categories. Within queens you can have men who dress as women, women who dress as women – and then you have drag kings, that can be a man dressing up in drag or a woman trying to impersonate a man. Drag kings are something that are often neglected by shows like RuPaul’s Drag Race because people see these hyper-feminine men in dresses and they forget that there are people who don’t necessarily identify with that. I’m trying to find if there are any men or women on campus who are interested in that sort of thing. Can you ever see it becoming part of the mainstream entertainment culture? For a lot of people it can be hard to differentiate between the performance elements and the identity elements of drag. Unfortunately, and particularly in the UK, the phrase ‘cross-dressing’ either conjures assumptions of transvestitism or of pantomime. ‘I actually went to speak to some college students at City College about these issues,’ says Jones. ‘For me, drag is very much a performance-based art. There are some weeks I can be hyper-feminine and then there’s other weeks I can be very androgynous. ‘I think drag kind of surpasses the gender boundaries that people seem to have set there. I think it’s very much about playing on a character, in the moment – that’s what I do, anyway – and when I’m done I put it aside. I think another thing people struggle with is having the differentiation between themselves and their drag personas. I try and consider it more an extension of who I am rather than a totally different being... I think people sometimes forget that there is a blurred boundary between drag and themselves. UoB Drag are always welcoming new members. To get in touch email drag@guild.bham.ac.uk or find their group ‘UoB Drag Society’ on Facebook.